A golden sword would be impractical, but a golden Wii remote can help adventurers conquer Link's latest adventure. Alfred, Lord Tennyson once advised his readers to "ring out the narrowing lust of gold." Fans of The Legend of Zelda can safely ignore his advice. 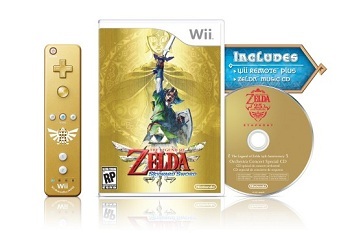 Retailers will sell a special $70-bundle for The Legend of Zelda: Skyward Sword that comes with a golden, Triforce-emblazoned Wii Remote Plus. Furthermore, every copy of the game's first printing will come with a bonus soundtrack disc. Zelda fans are no strangers to golden promotional items. The Legend of Zelda, Zelda II, Ocarina of Time, and Majora's Mask all had gold-colored cartridges to commemorate the latest installment in Link's chronologically-confusing story. However, disc-based media proved a little harder to gild. While Wind Waker and Twilight Princess featured golden artwork on their discs, there was no way to make an entire disc look like it came from a Hyrulean treasure chest. The remote seems like a fair workaround. Between the verdant protagonist, the eclectic gadgets, and the golden memorabilia, Link's latest adventure looks to be upholding all the tenets of its longstanding franchise. Skyward Sword will continue the Zelda legacy, in terms of both game design and promotions, on November 20, 2011.